"If it takes a village to raise a child, it takes a village to abuse one." That line, spoken by Mitchell Garabedian (Stanley Tucci), a lawyer representing victims of sexual abuse, cuts to the heart of Tom McCarthy's Spotlight, a calm and concise celebration of calm and concise journalism. In recreating the story of how Spotlight, an autonomous investigative unit within the Boston Globe, reported on the cover-up which allowed Catholic priests to sexually abuse thousands of children over several decades, McCarthy's film is as much a portrait of a city in thrall to the Church as it is a dramatisation of the investigation itself. 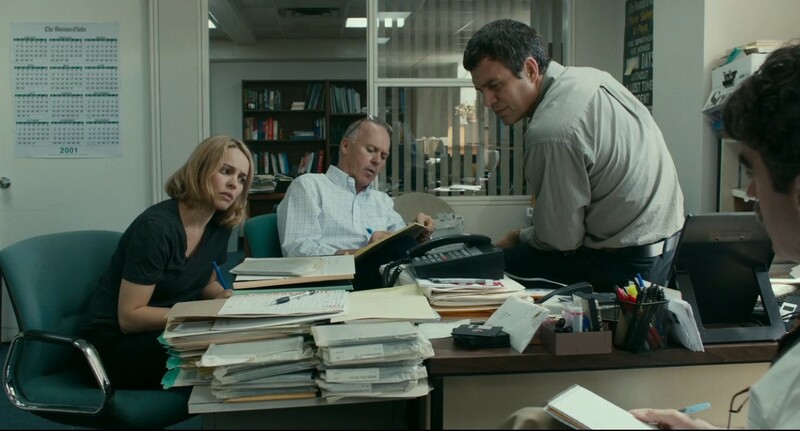 Like Alan Pakula's All The President's Men, Spotlight is a story of reporters trying to break a story that everyone else already seems to know about, and facing opposition from every strata of Boston society in the process. Its vision of Boston as an insular community unable or unwilling to acknowledge the crimes being committed is not merely reflected in the story, but is integral to its characters. The Spotlight team are pointed towards the scandal by the Globe's new editor Marty Baron (Liev Schreiber), and much is made of the fact that Baron is Jewish and had never been to Boston before being appointed to the job. As someone with no cultural ties to the city - going so far as to refuse free tickets to Red Sox games - and no religious reason to be awed by the Church, he is willing to risk a potentially volatile backlash from the overwhelmingly Catholic population if it means pursuing the story to its ultimate conclusion. It takes someone with an outsider's perspective to realise that this is something that shouldn't be buried in the Metro section. The focus on Baron's Jewish background reveals Spotlight's quiet but pointed spirituality. It's not spiritual in the sense that its characters are constantly talking about their faith or what they believe, but because it treats those aspects of their lives as incredibly important. The central crime, of men in positions of authority using their power to molest vulnerable boys and girls, who were then protected by a Church hierarchy which paid victims off and moved priests around so that they could continue to abuse children, is treated as heinous not merely because of the physical violation that occurred, but because of the spiritual violation. The sheer number of churches seen in establishing shots, or the way in which bells play in the background of scenes, speak to the omnipresence of the Church as a political and social force in Boston, constantly restating how enormous Spotlight's task is. It's also significant that the entire Spotlight team, consisting of Mike Rezendes (Mark Ruffalo), Sacha Pfeiffer (Rachel McAdams), Matt Carroll (Brian d'Arcy James) and Robby Robinson (Michael Keaten), is also made up of lapsed Catholics. It gives them enough of a distance to follow the details wherever they might lead, but not so much that they aren't shaken by the process of uncovering decades of abuse. When, several months into the investigation, Pfeiffer mentions that she has stopped going to Church with her grandmother, it's a passing comment which hints at a far deeper disturbance: Something that she had done for years out of a sense of loyalty has suddenly been rendered unconscionable. On the surface, the only change to her life is how she spends a few hours every other Sunday, but it represents a fundamental shift in how Pfeiffer views an institution that has been in the background for much of her life. Spotlight is built on small moments which portend far bigger ones, on the pebbles that create tidal waves. It's telling that the most suspenseful moment in the film is a montage of the Spotlight team using rulers to mark names in a directory before entering the data into Excel. It isn't a film of sudden revelations or high drama, but of scenes in which evidence accrues to a level where the truth becomes overwhelming. That plays out on a macro level, considering the impact that the story would eventually have, leading to revelations of systemic abuse all over the world and dealing a blow to the Catholic Church from which it has never recovered, but also in the lives of the characters. When Robby discovers that a close friend has been complicit in helping the Church with their cover-up in Boston, or when the investigation leads to his old school, Keaton maintains a calm demeanour even as he pursues lines of inquiry that could destroy decades-old relationships. It's illustrative of an obsessiveness and focus that underpin both the characters and the film. The reporters follow every lead as far it will go, even if it puts their sense of wellbeing at risk, while the film is so keenly focused on their work that it offers almost no glimpse of their personal lives. We know that the members of the team are married and that some of them have kids, but their families appear very briefly or never at all. The lives of the characters are incidental to the work that they are doing, something which the film and the reporters seem to agree on. Tom McCarthy has always been a restrained filmmaker, and while Spotlight is an understandably more somber work than The Station Agent or The Visitor, his reluctance to let the emotional nature of the subject matter overwhelm the storytelling serves him well. It gives the moments when emotions do burst through, such as a moment when Phil Saviano (Neal Huff), a survivor of abuse who has spent years trying to get people to report on the story, lays out the terrible cost of the abuse, more power for emerging from an otherwise even-keeled story. Other outbursts are less effective. A scene in which Rezendes, furious at being told that the story is going to be delayed while they gather more information - a delay which could risk other papers scooping their work - lays into Robby falls completely flat. It's partly down to Ruffalo's delivery, which is so mush-mouthed that it doesn't really allow for histrionics, but also because it's one of the few moments that feels like it belongs in a typical movie. Spotlight is not a film designed for big shows of emotion. It's a quiet, methodical study of people knocking on doors, collecting information, and changing the world. It's also one of the year's best films.